I always have the same recurring theme in my dreams. It always has to do with either not being able to finish High School or being tormented in High School. (I have finished High School... and College too!) I'm always really close to graduating, but I can't because I've failed one course or that one course isn't available. Secondly, I dream about old friends in High School or old bullies (real or imaginary) giving me a hard time. 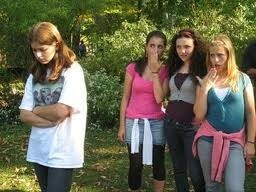 If I ever have a dream about being humiliated, it almost always takes place in High School. It's been 10 years since I graduated, so I'm sure you can understand my confusion! Humiliation has a long history, especially public humiliations and punishment which secured social order. The Bible speaks of stoning which evidently still exists in Iran. At the trial of Socrates the primary rhetorical method used by his accusers was "character assassination" by defamation.The use of the guillotine in France and England is given a malevolent voice by the Queen of Hearts in "Alice in Wonderland" who commands repeatedly "off with their head". Firing squad's, hangings, electrocutions, lethal injection all attest to the perverse creative corporeal and capital punishment methods used to secure social order. Public degradation ceremonies have also had a long history. Today the concept is closely related to "dishonorable discharge". The "white supremists" like the "Ku Klux Klan" (Circle of Brothers) were basically know as an organized "lynch mob". The silent film "Birth of a Nation" glorifies the Klan. Of course Hitler and the Nazi's concepts of the "master race" and "racial purity" were first implemented under Hitler's "Lebensraum plan and policy". At first the Nazi's endeavored to humiliate the Jews by publically identifying (wearing of the Star of David on their clothes) them, then decided in their "Final Solution" of the "New World Order" to exterminate the Jews as well as all other genetically inferior people and races. President Richard Nixon endured public humiliation caused by the Watergate scandal and the revelations of his involvement, which finally led to his resignation. Later Nixon would endeavor to politically rehabilitate himself. Growing up, we all feel humiliation at one time or another, these humiliations of everyday life act as traumas and developmental fixations to our sense of self and our self esteem. We begin to build defense mechanisms to protect ourselves from being humiliated or feeling humiliated. These self-defenses usually act only to compensate for the "paranoia" of the anxiety related problem but not solve it. The old bullies "real or imaginary" are perceived in the dream as still giving her a hard time ten years later. 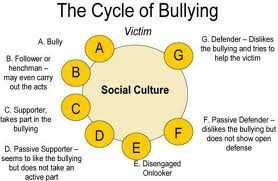 Communities and schools in North America appear to have become more sensitive to the real issue of bullying. The persecution feelings found in this recurring dream may have developed into a full blown psychological complex. John Jackson's chapter "Bureaucracies at Work" (1) informs us "Sadly, in the world of work, as elsewhere, bureaucracies latch onto, even welcome, opportunities to unite the tribe by igniting the social human's inherent distrust and conflict with the individual. This was the theme of Golding's "Lord of the Flies", a theme familiar to observers of school playgrounds. The weaker the individual available for bullying (torture) the better: the less the risk of retribution by the individual and the easier the task of persuading the whole tribe to join in the fun." Franz Kafka's concept known today as the "Kafkaesque" spoke of the social alienation caused by menacing and intimidating bureaucracies. Silvia's recurring nightmare represents one more "repetition compulsion" of the "Groundhog Day" of those collectively dreaming in the "global village". Humiliation and persecution not only represents an individual problem, it is also a collective one as the brief history above attempts to show. 1. In Joseph H. Berke (et al) "Even Paranoids Have Enemies: New Perspectives on Paranoia and Persecution" (p133).